Download this Task Manager - Project Planner Template in PDF format and use this great tool to manage your projects, plan your task lists and keep track of your to-do-list. Add different phases to your project planner, then add individual tasks within each phase to make managing your project task list as easy as possible. You can also add information sections in this project planning template which helps you keep track of key decisions, all sorted into logical segments of your project planning. It comes with a project management cover page where you can add your business logo or an inspiring image that relates to your project. You can download this free project planning template / task manager template and use for your own personal use. Download the Task Manager Project Planner PDF Tool here. 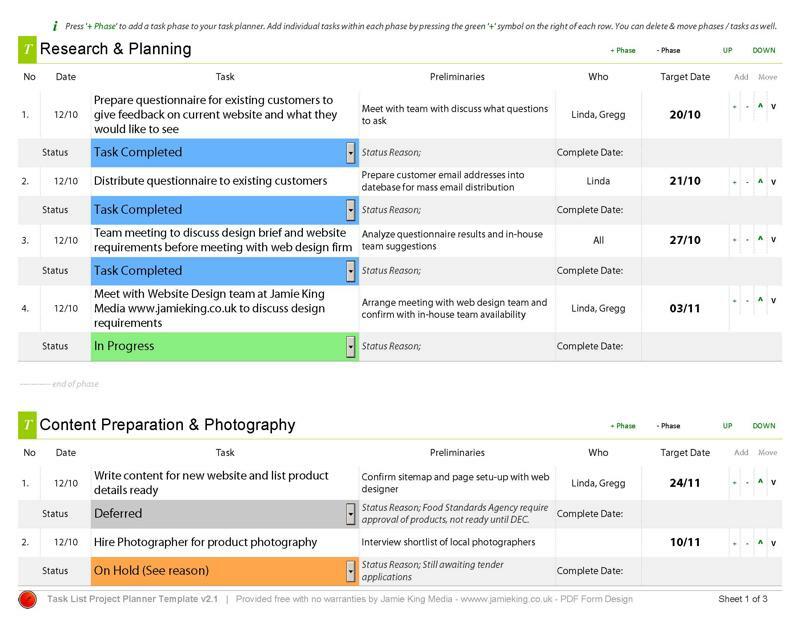 Here are some screen-shots of the task manager project planning template, compiled with some dummy project information to give you an idea of how this task list template tool can work for you. You can read more about how to use this tool here. Above is the cover page of the project planner template. 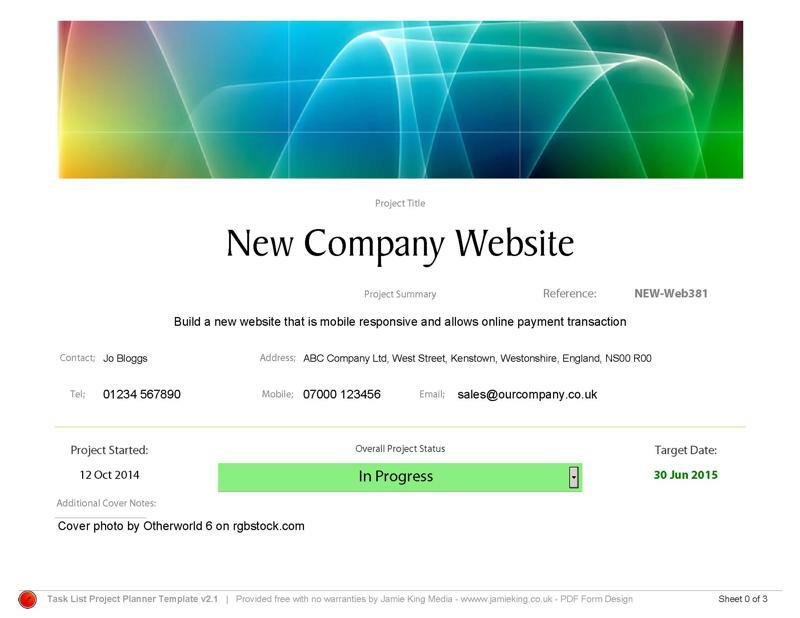 It allows you to add a custom image header or company logo, title your project, provide a description and basic contact details. You can set the progress status of your project and the target date within this task manager template. The above image shows the task phase list. You can add as many phases to your project planning as you like and as many individual tasks within each project phase. You can set task statuses which change colour accordingly to the status allowing you to easily see what tasks need your attention. This project planning app / tool has been built to be as flexible as possible to fit a wide range of circumstances and scenarios. It may not suit all requirements, such as those concerning financial project management elements or projects that require details time line planning. This task planner allows you to add phases to your task list. You can add, remove and re-arrange task phases within the PDF document. Break your project down into phases and then add individual tasks to those phases, which allows you to break your project up into manageable portions. You simply add a task using the add / remove buttons as well as move each task into a more logical order. Each task consists of 2 rows with a range of information fields. Note any preliminary tasks that need to be done before a task can be completed, such as 'order the paint' before 'painting the bedroom'. You can specify target dates and set a status against that particular task, such as 'In Progress' or 'On-Hold' if you need to come back to that task. There is an information section, which again can be organised into 'information sets' that perhaps relate to your project phases above. You can use the information sections to add notes about your project and keep a record of key decisions made throughout, such as 'what wood type to use' in your 'new bespoke kitchen design'. Still not sure how to use it? Download a mock-up website design project - a project where you are looking to build a new company website. This is a free project planning tool that I created for people like you. If you find this tool useful please share this page, link to this page and support it here. If you have any suggestions please don't hesitate to email me with ideas. If you need something similar customised for your needs, get in touch for a cost.